When it comes to instructions for building your first house, or your first bench, or your first Google Earth model, there is no shortage of available materials. But what happens after you’re a SketchUp rockstar? Where are all the tomes full of delicious inspiration for those of us who have mastered inference locking and nested section planes and scene properties? It’s all fine and well to read about how SketchUp works, but real progress comes from peeking over our peers’ shoulders to see what they’re working on. 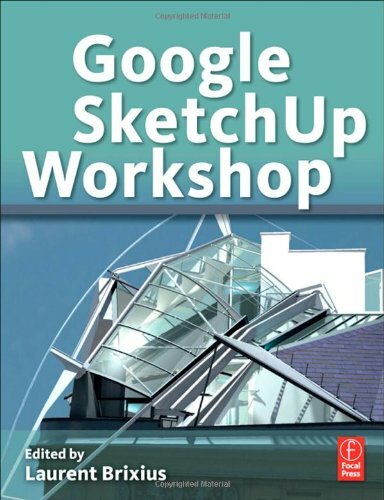 And that’s exactly the concept behind Laurent Brixius’ brilliant new book Google SketchUp Workshop. Translated from the original “Créer avec SketchUp” (originally published a few years ago in French) this full-color volume presents sixteen beautifully illustrated case studies authored by expert SketchUp users from a multitude of different disciplines. Each one includes high-level workflows, tips and techniques for using SketchUp in a different field of design. Architecture, urban design, engineering, process plant design, woodworking, theater set design and architectural graphics are all represented. Our friends over at SketchUpArtists.org conducted a nice interview with Laurent (the book’s editor) before the English edition came out. An architect, architectural 3D artist and author from Belgium, he’s done an amazing job of assembling a collection of projects that are pure inspiration. This is a book that belongs on the shelf of every SketchUp aficionado. the French version is brilliant, full of interesting techniques. Laurent also released some SketchUp classes on DVD (French sound track) that worth the money too, look for it on Elephorm's website.